“We appeal you to be fearless! Come together, right now, for a change. Change in you, change in the society!” With this rousing call to action, young people involved in the Empower Youth for Work project in Bangladesh have set up their own Youth Parliament to give young people more say in their society. A group of 27 young people – inspired and empowered by the EYW training and activities, and determined to strengthen youth participation in decision making – have formed their own Youth Parliament, an umbrella group that represents young people from all nine wards of Ranipukur in Rangpur district. Group members, all of whom are aged between 18 and 29, got to know each other when they took part in the EYW project’s household survey, soft-skill training and ward/union-based group-formation activities. Determined to find a sustainable way to raise the voice of youth, the young people selected members (70% female, 30% male) who could represent their wards in the Youth Parliament. As the parliament’s mission was to work for the development of society and continue EYW’s work without being dependent on EYW, they also recruited members from outside of the project’s youth groups. Group members have a diverse range of educational qualifications and backgrounds; several members are married, some are still studying and some are working. Despite these differences – and the fact they don’t even live in the same village or ward – members are united by a common determination to improve their society, and a strong belief in the importance of young people’s contribution. Each of the parliament members is working in different ways to contribute to positive change in her or his own community. For example, Atik led a mass literacy campaign through which 70% of illterate villagers learned how to sign their name. He is also involved in awareness-raising activities, sharing short dramas on Facebook. Shahjada shared how he and his fellow group members convinced his younger brother to set up an IT firm locally, instead of in Rangpur. As a result, for the first time, several youth can take part in IT training in the small town of Ranipukur instead of having to travel to the city, which could have presented a major barrier to young women in particular. Group members also mentioned the popularity of the street dramas they perform in front of hundreds of villagers to raise awareness of and help prevent gender-based violence. 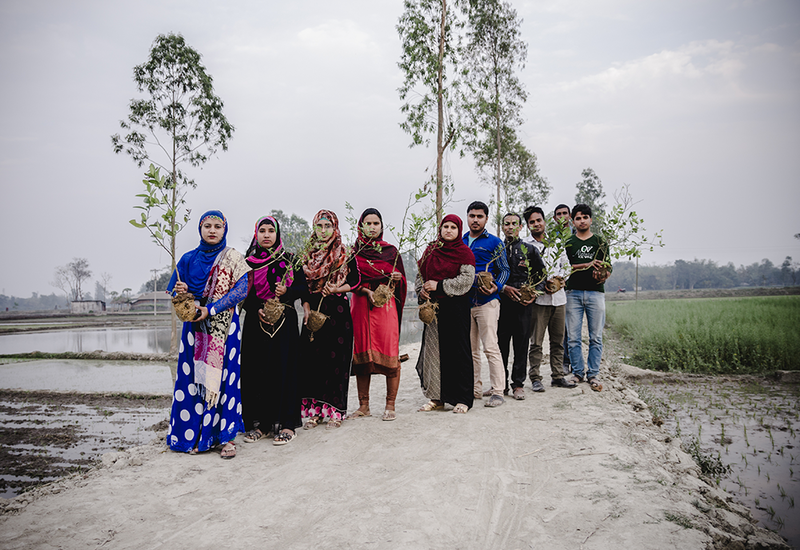 The biggest achievement for the Youth Parliament to date has been a climate-friendly initiative in two wards of Ranipukur to plant 300 fruit tree saplings – lemon, papaya and guava. Villagers each donated two seedlings and helped with the planting. By contributing to climate change adaptation, involving the wider community and gaining permission from local authorities, the plantation program helped to create widespread respect and support for the Youth Parliament.